Operation Western Strike was not your average artillery exercise. It was in fact a 20-year first for the Arkansas Army National Guard’s 142nd Field Artillery Brigade. According to COL Nicholas Jaskolski, commander of the 142nd, the unit’s five battalions each transported one dozen pieces of heavy artillery and supporting equipment via railway to Wyoming National Guard’s joint training center, Camp Guernsey – a task the entire unit has rarely executed. The event was an emergency deployment readiness training and field artillery gunnery exercise that took place early last year. It involved all 1,200 of the personnel that make up the 142nd’s five battalions – consisting of three battalions from Arkansas, one battalion from Alabama and one battalion from Tennessee. In addition to personnel, the training required hundreds of vehicles, including 12 Multiple Launch Rocket Systems (MLRSs), brought by the 142nd’s 1st Battalion; 12 M777 towed Howitzers, brought by the 142nd’s 2nd Battalion; 12 High Mobility Artillery Rocket Systems (HIMARS), brought by the 1st Battalion, 181st Field Artillery Regiment, Tennessee Army National Guard; a dozen Paladin Howitzers, brought by the 117th Field Artillery Regiment, Alabama Army National Guard; plus high mobility multipurpose wheeled vehicles, light medium tactical vehicles, ambulances, fuelers and gun trucks brought by a combination of the participating States. Getting the equipment to Camp Guernsey was no small feat. Units from all three States performed extensive railroad operations as part of the initial leg of Western Strike. A total 150 Soldiers moved over 950 pieces of equipment, using 270 railcars on five trains. Working together, using knowledge and ingenuity over the course of four days, the Soldiers delivered all equipment to Camp Guernsey without mishap. LTC Sanders said the biggest factor in successfully loading the cars was the condition of the railcars to which the equipment was being attached. Old rusty tie-downs can be difficult to move into place to hook onto the shackles on the vehicles. That was the most strenuous part of the task, he said. If the chains and shackles were in good condition, the chains could be easily moved up and down the train cars and into position, which makes the process go a lot smoother. But if they are not in good condition – what then? 2LT Leynna Ottenbacher is platoon leader for Alpha Battery of the 1-142nd. Her Soldiers were tasked with moving their unit’s MLRS and other equipment onto the rail cars. It was unfamiliar territory, she explained. The Alpha Battery, 1-142nd Soldiers did their work in coordination with civilian contractors, some of whom were prior military. Working with former military helped operations quite a bit, according to 2LT Ottenbacher. The contractors’ past service experience made them familiar with Army terminology and requirements, which made communication between the groups – a vital component to executing the mission – much easier. Once all equipment and Soldiers were accounted for onsite at Camp Guernsey, the brigade began the core work of the operation. 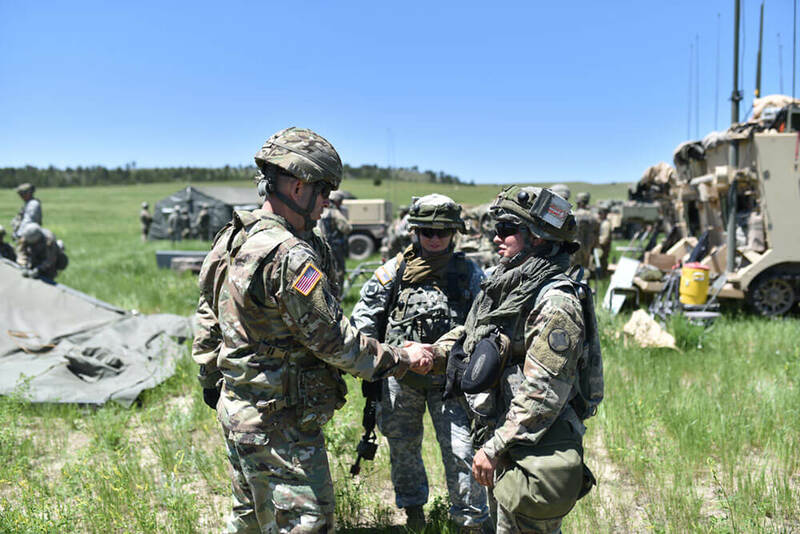 Live-fire exercises dominated the two-week exercise, with all five battalions completing Table XVIII artillery certifications. The Arkansas Army National Guard’s 217th Brigade Support Battalion participated in the training, providing transport fuel and ammunition. 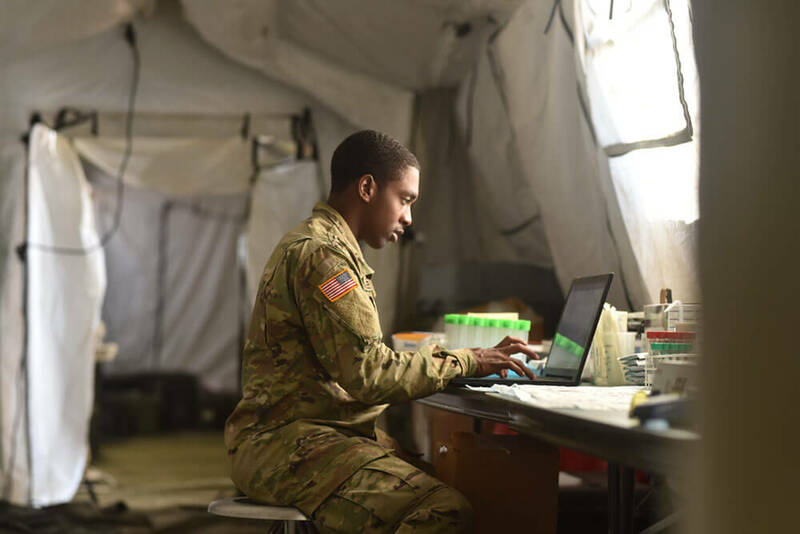 To bring a level of realism to the exercise, Arkansas Army National Guard’s Delta Company, 2nd Battalion, 153rd Infantry Regiment, played the role of the opposition force during Western Strike; and the 213th Medical Company provided medical support. Operation Western Strike would be the 213th’s last operation before being disbanded. 2LT Ottenbacher noted that much of the operation’s benefit came from the opportunity to perform live-fire exercises in a new location. The units of the 142nd have executed live fire at Fort Chaffee so many times that the repetition of doing the same tasks in the same places has begun to create complacency within troops, she explained. SSG Joseph Capps is a section chief for Bravo Battery of the 2-142nd. He oversees the operation of one of the battery’s Paladin Howitzers and its accompanying ammunition carrier. He too noted that Wyoming was a welcome change of scenery. “The learning curve involved with figuring out where things are was a really good challenge for most of our sections,” he said. SSG Capps is not faint of heart when it comes to pushing his skills and the skills of Soldiers. He said that his favorite part of training for live fire is practicing degraded operations – that is, directing the fire of a Paladin without the analyzing power of a computer. All one has in a degraded situation is any manual equipment on hand and the human computer between one’s ears. It’s old school “artillery-ing,” hearkening back to Vietnam and World War II, SSG Capps said. Under normal circumstances, an automated computer provides the heading. Then, based on mission objectives’ input by the unit’s command, the computer may send updates and adjustments to that heading. Manual gunnery requires setting the position with a compass, ground stakes and engineer tape to mark the azimuth of fire on the ground. The gunnery sergeant uses basic survey equipment to confirm the pointed direction for the azimuth, SSG Capps explained. 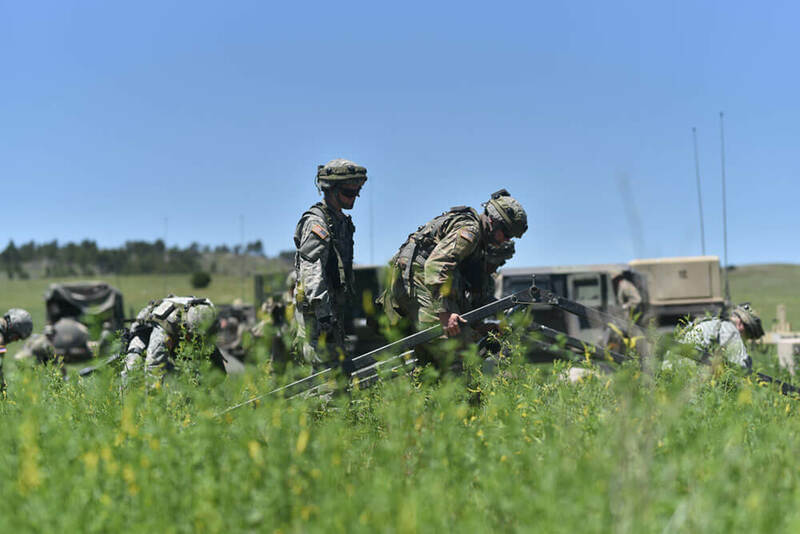 From rail loading to raining artillery shells on target, Operation Western Strike abounded with training opportunities for the Soldiers of the 142nd. It served the Soldiers well, helping to improve readiness, cohesiveness and proficiency. Together the MLRS of the 1-142nd and the HIMARS of the 1-181st fired over 100 rockets during Western Strike. That included both guided and unguided munitions with a range of up to 26 miles. Guided by the Army’s Tactical Missile System, these munitions can range up to 190 miles. Together, the Paladins of the 1-142nd and M777 towed howitzers of the 1-117th fired over 2,400 155 mm rounds during Western Strike. These munitions can travel over 18 miles using rocket assistance. 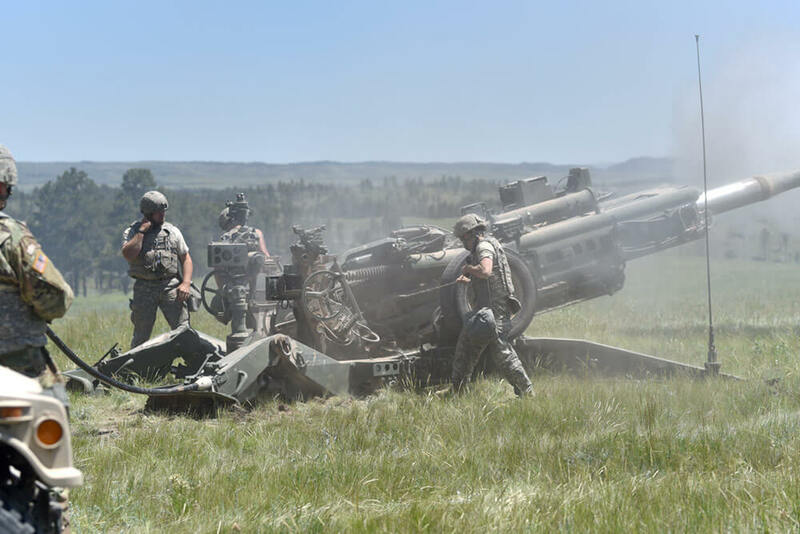 To keep the 142nd’s artillery properly functioning and firing through the duration of Western Strike, the 217th completed over 80 supply distribution missions – including 40,000 gallons of fuel and approximately 500,000 small arms rounds.